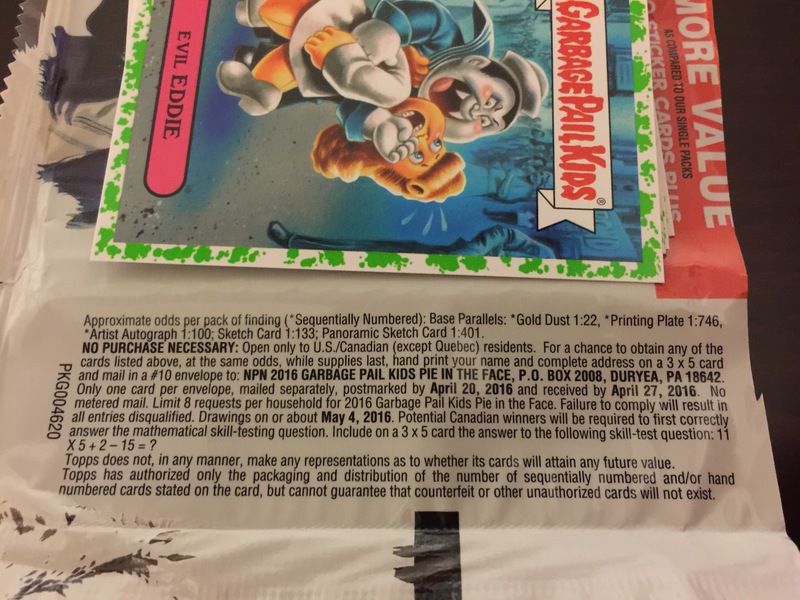 Blaster boxes begin showing up in the wild today. 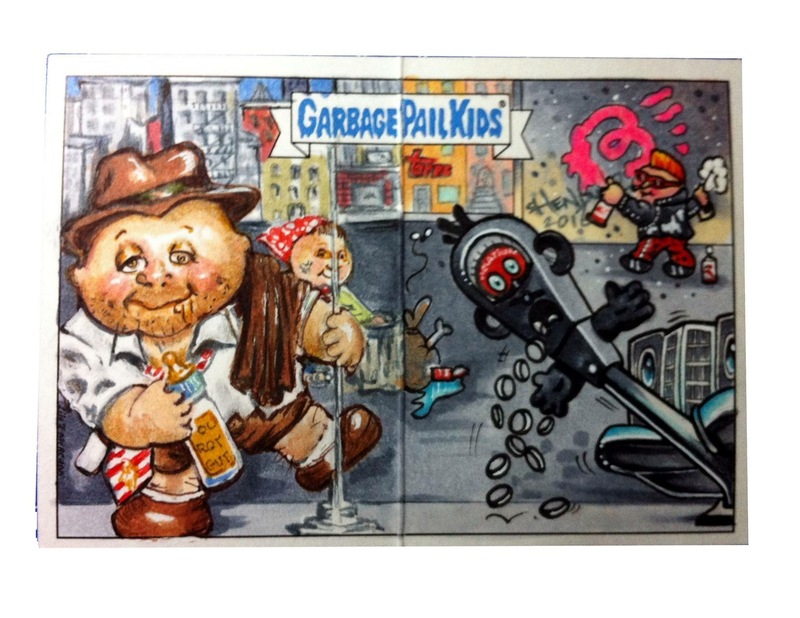 Thanks to collectors GPK Joe and Matt Steffens for the picture and info on odds. 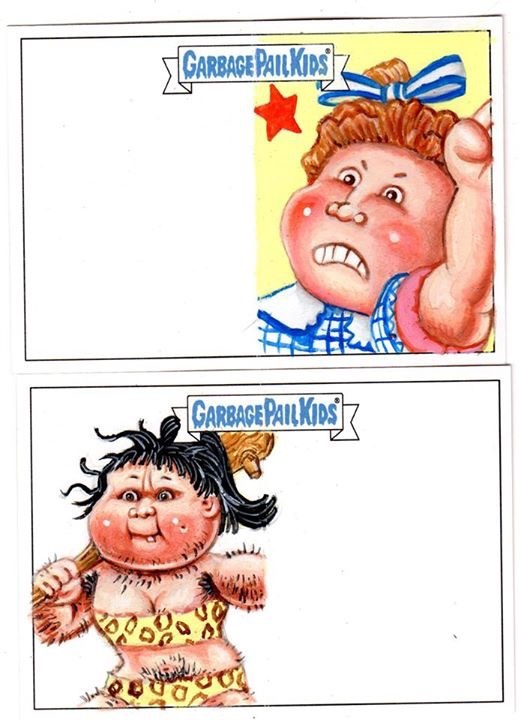 Below are the odds on the side of the boxes. 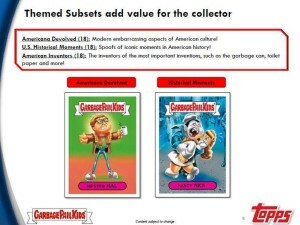 As usual it appears the odds are the same as retail packs. 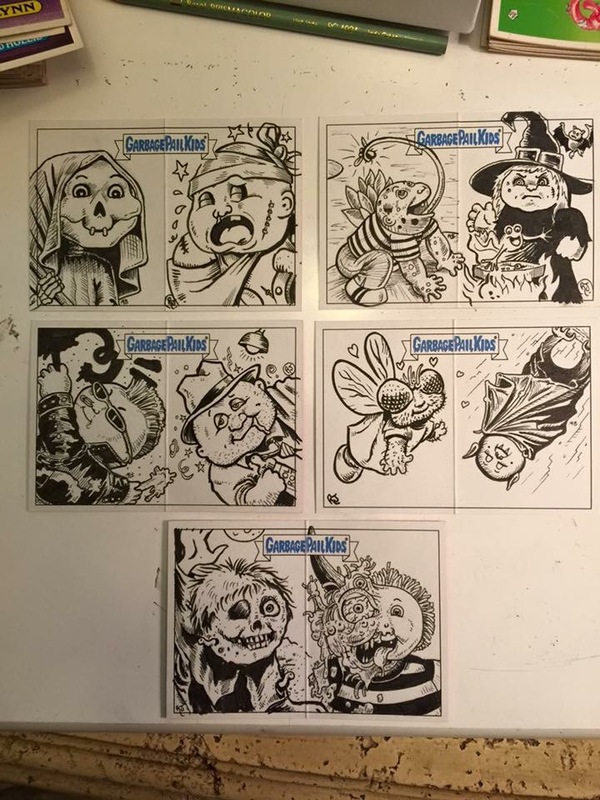 The notable exception are the odds for the Loaded Sketches, which for this set are exclusive to Blaster Boxes. 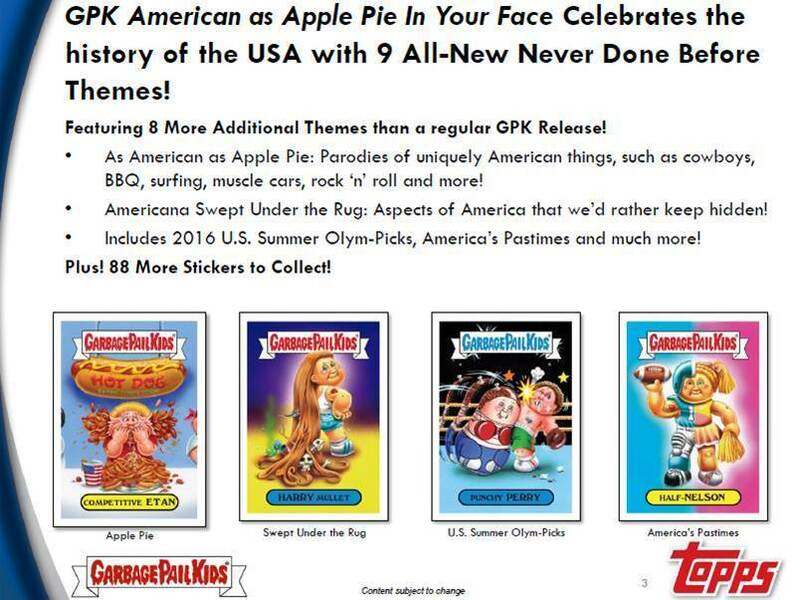 A few months ago we posted the sell sheet for Hobby/Collector boxes for the 2016 Garbage Pail Kids As American as Apple Pie In Your Face set. Here is the sell sheet for the Retail version of the product. 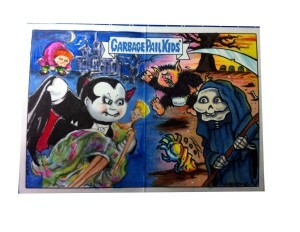 (PDF version can be found here.) 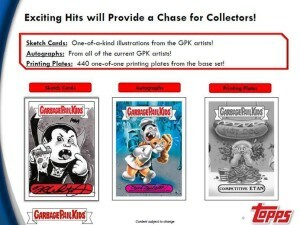 Most of the info is not new here, but good to see the sell sheet info from Topps. 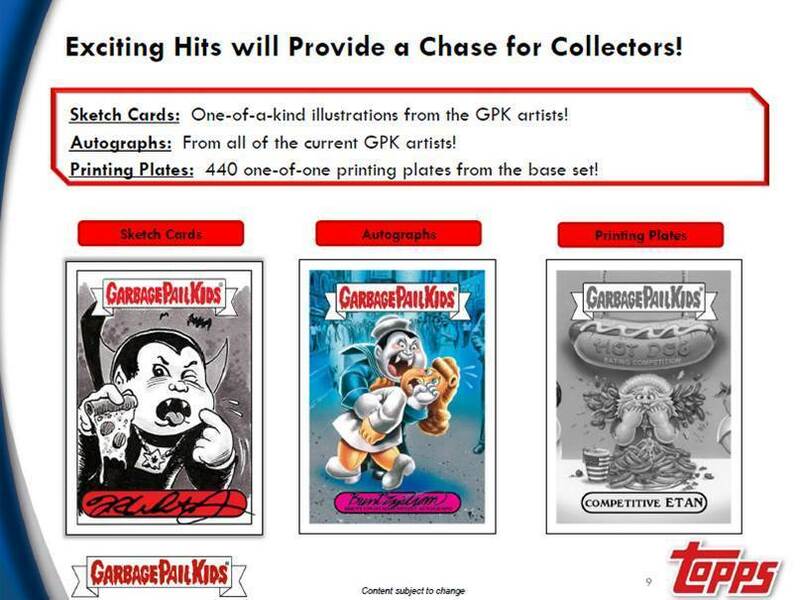 Two other cards types not mentioned on this sell sheet. 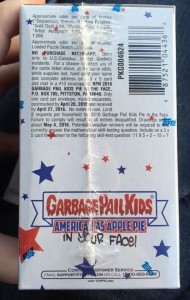 1) Pee Parallels that are found in gravity feed boxes from Target. 2) There will once again be 2 pack Blisters that come with one of two special Adam Bomb cards, similar to the Blisters from the 30th set that contained the special foil cards. 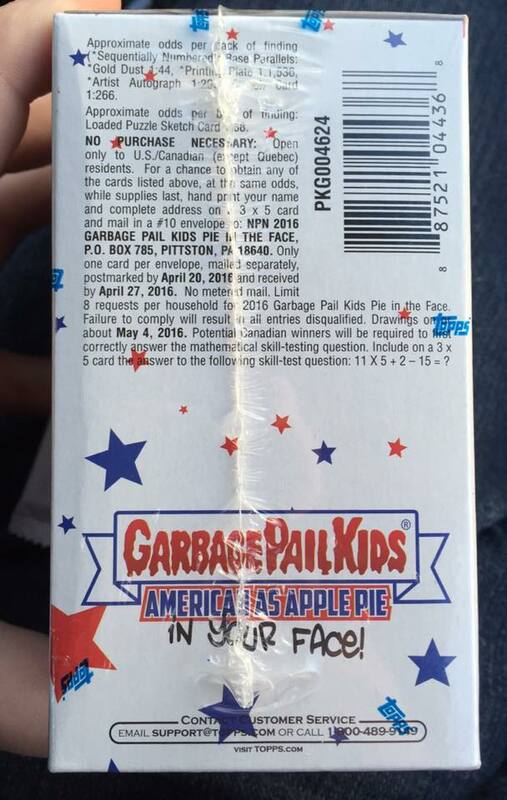 2016 GPK Apple Pie officially releases this coming Wednesday, 1/20/16. 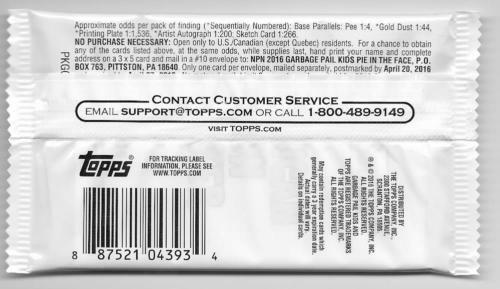 Thanks to eBay member allproductssoldhere for sending along the odds for the 2016 GPK Apple Pie Retail Gravity Feed packs. 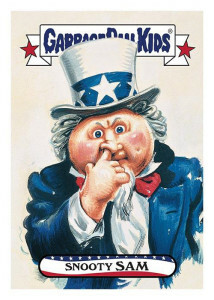 More odds to come as they filter in. Updated with additional sketches on Jan 15th @ 18:12. 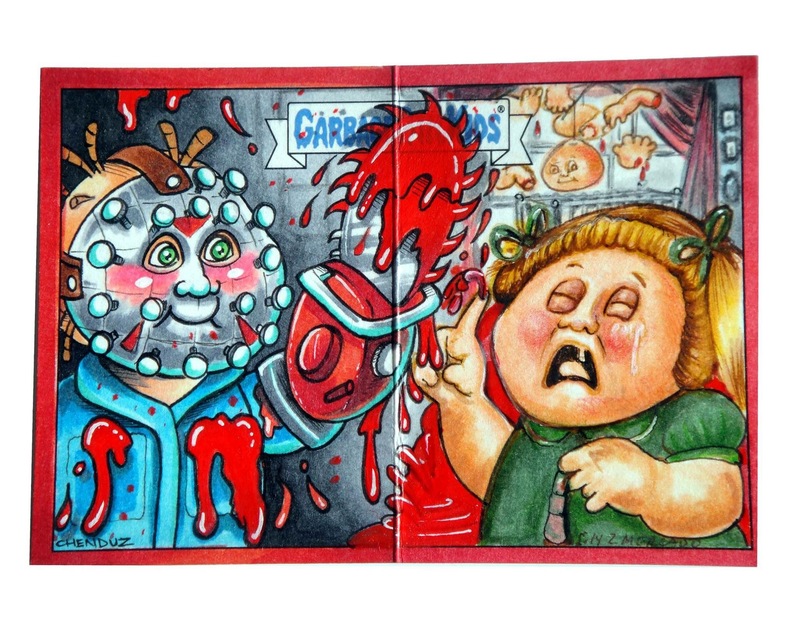 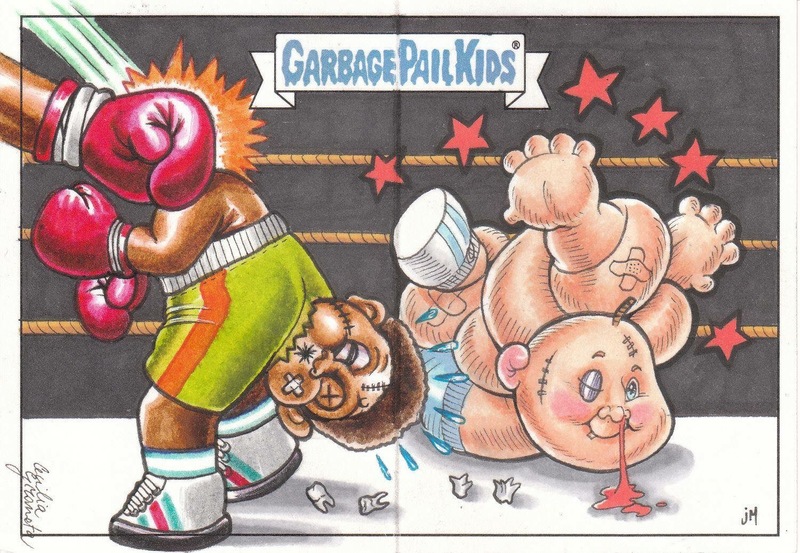 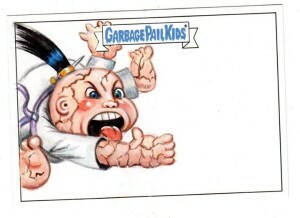 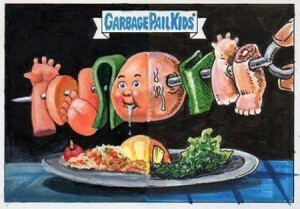 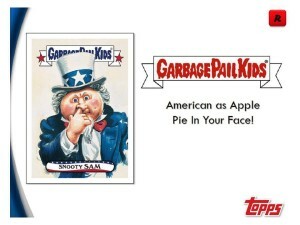 A new concept to Garbage Pail Kids sketch cards is set to debut with the next set, 2016 GPK American as Apple Pie In Your Face, Duel Artist Sketch Cards. 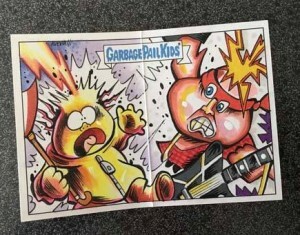 For the first time you will be able to pull from packs a duel panel sketch card featuring artwork done by two GPK artists! 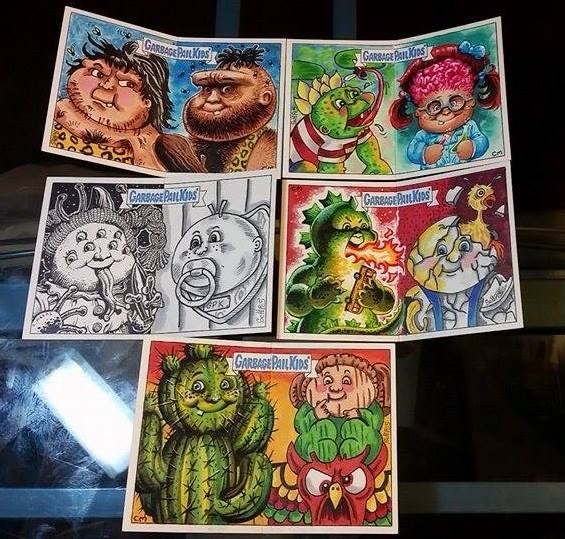 Veteran GPK artist Jeff Zapata shared examples of some of these duel artist sketch cards he created with fellow GPK artist Dan Burn Webster. Duel Artist sketch card done by Cecilia Granata and JM Monserrat. 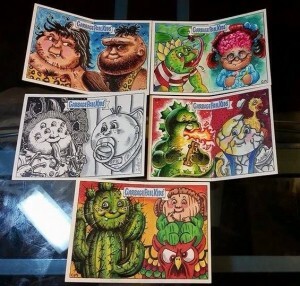 Here are some more Duel Artist Sketch cards posted by Robert Jimenez that he did with Michael Barnard. 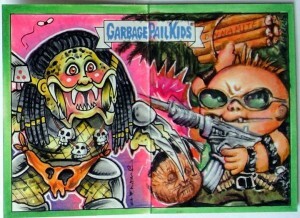 Duel Artist Sketch cards created by Dustin Graham and Steve Potter. 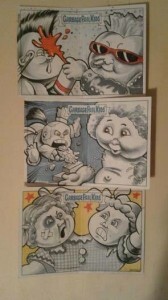 Duel Artist Sketch cards created by Chad Scheres and Chris Meeks. 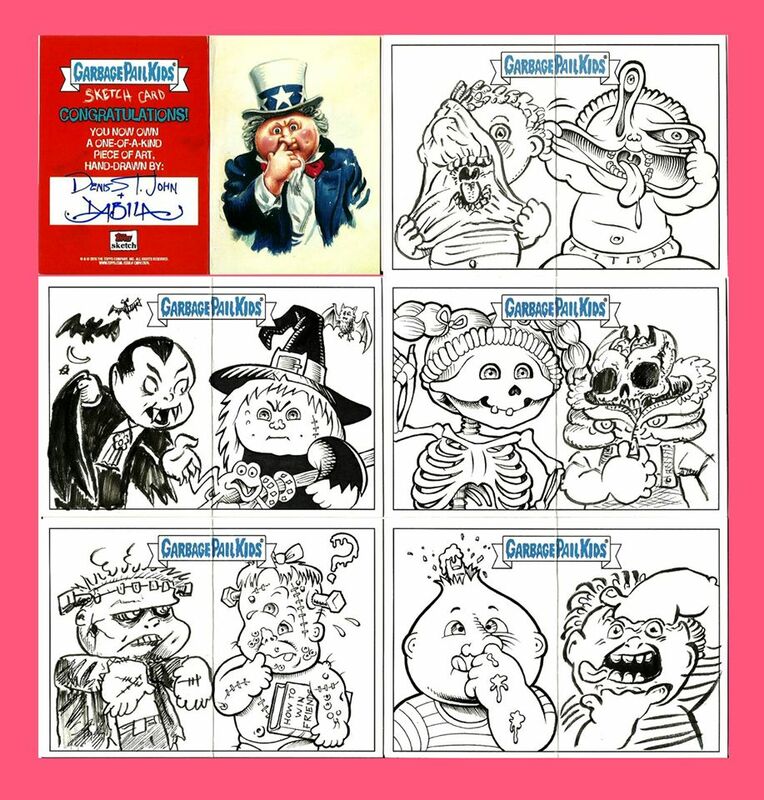 Duel Artist Sketch cards created by Jon Gregory and Simone Arena. 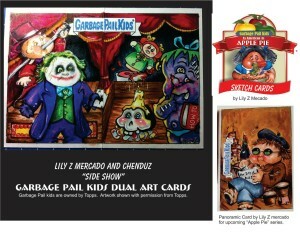 Duel Artist Sketch cards created by Lily Mercado and Chenduz. 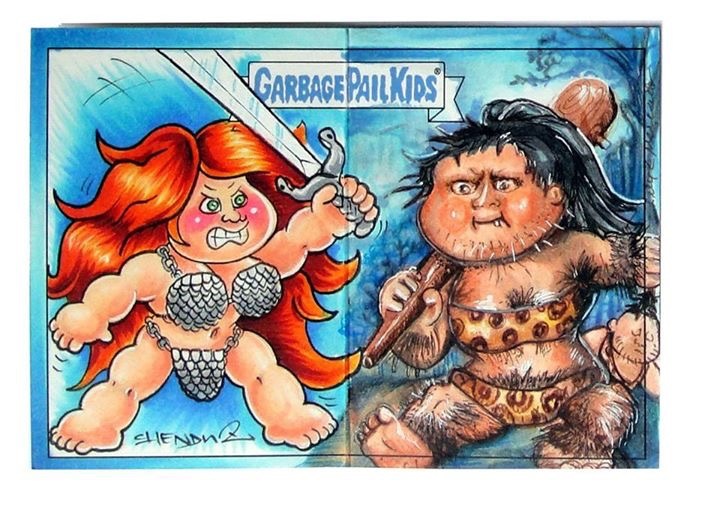 Duel Artist Sketch cards created by Neil Camera and Mark Pingatore. 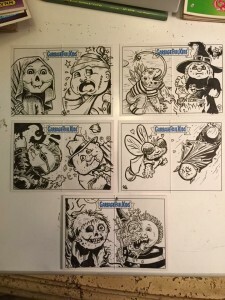 Neil posted these without Mark’s work. 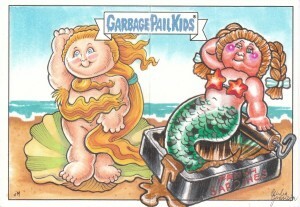 Neil did request is anyone pulls these to send him a picture. 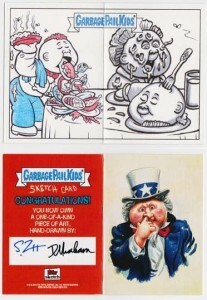 Duel Artist Sketch cards created by GPK Dave and Dennis St. John. As Topps is set to release 2016 Garbage Pail Kids American as Apple Pie In Your Face set next week, new details are coming out on some surprises they have in store. 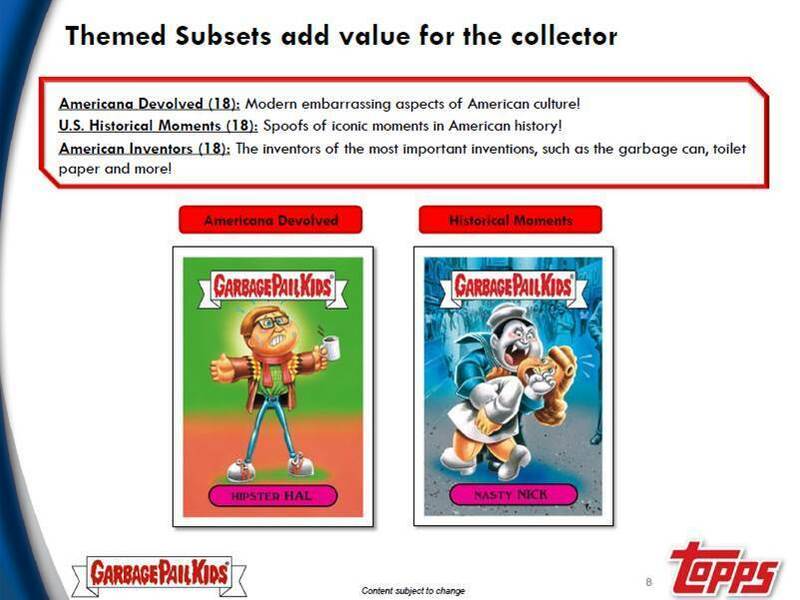 As we mentioned in an article last week, Retail Blaster boxes will include 3 Gross Bears cards per box. GPKworld.com broke news on their Facebook page that those Gross Bears cards will be based off the 1985 Topps Gross Bears Button set. 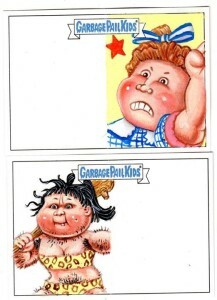 GPK World also mentioned those cards will be found in Walmart Blaster boxes. 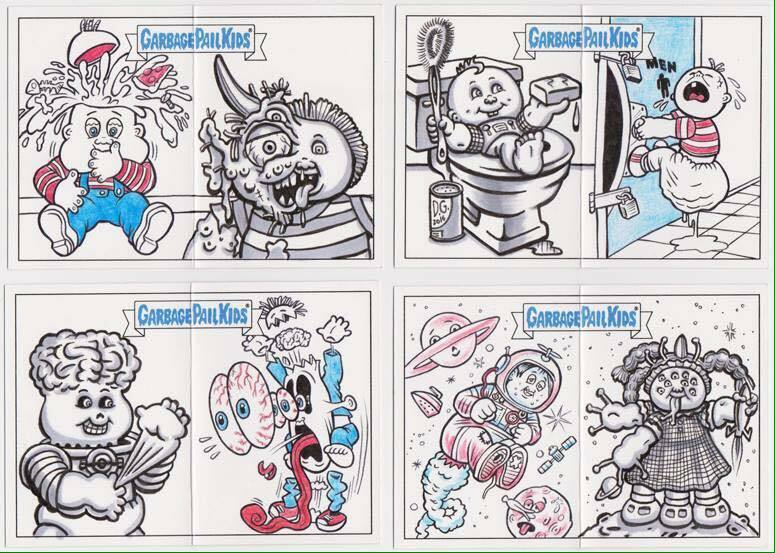 GPK World also reported that Target Blaster boxes will contain 3 Bathroom Buddies cards, based off a 90’s GPK spinoff set. 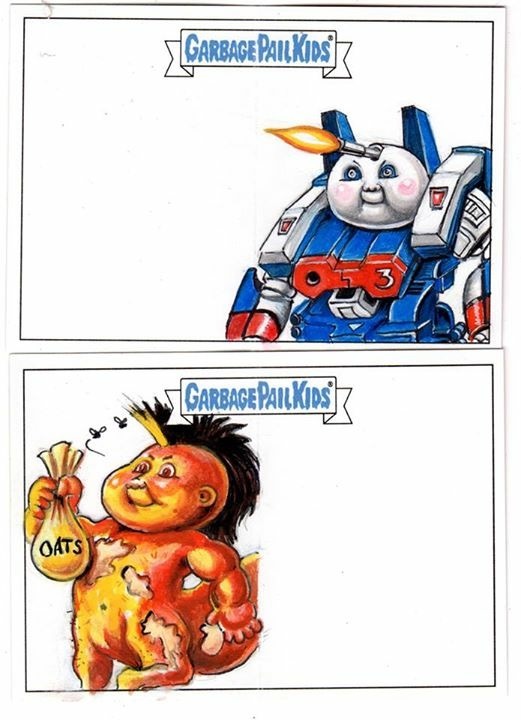 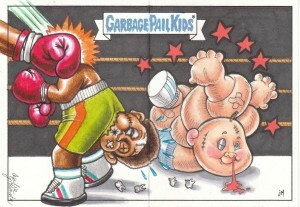 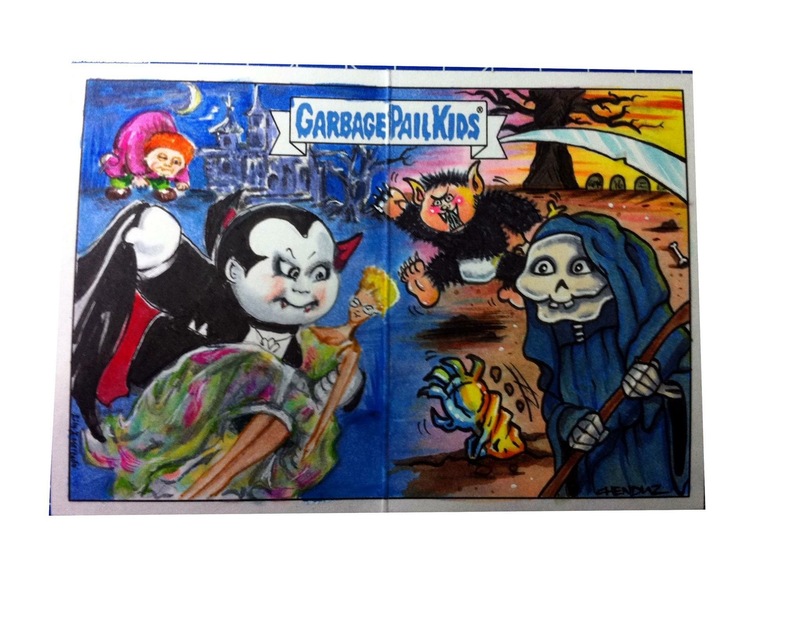 Finally GPK World offered up a sneak peak at the wrapper art for this set. 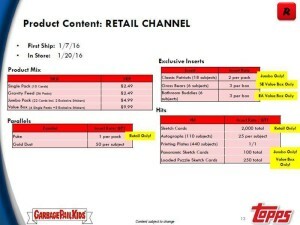 The next release is set for Jan. 20, however retail will often hit stores early. Keep your eyes open this weekend for these packs. 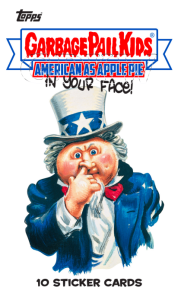 Online retailer Steel City Collectibles has begun online pre-orders for Blaster boxes of the upcoming 2016 GPK American as Apple Pie In Your Face set. 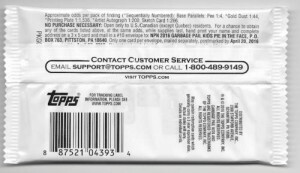 New information posted on their website gives some insight into what can be found in both Blaster boxes and Jumbo Retail packs. 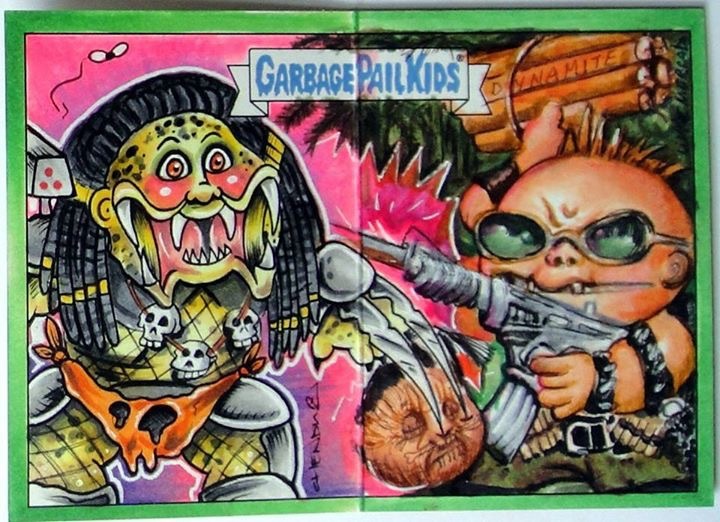 Perhaps the biggest news is Loaded Sketch cards will move to Blaster boxes. 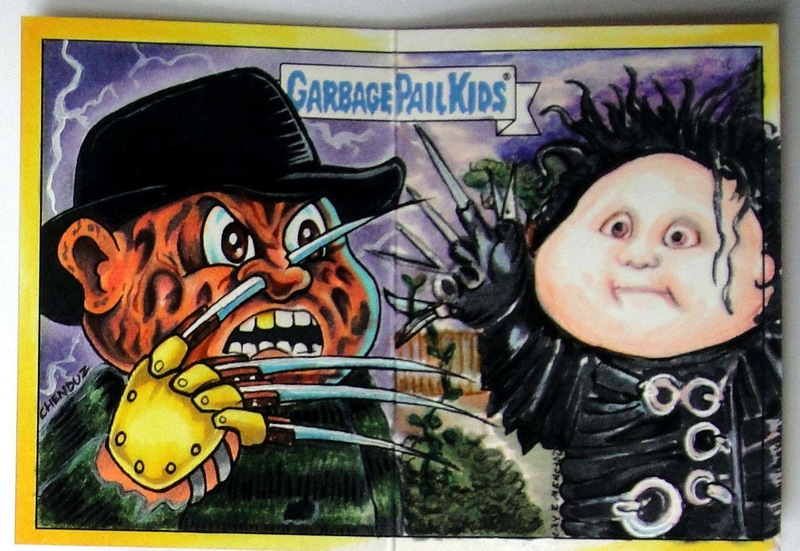 In the previous GPK release those sketches were found in Collector boxes. 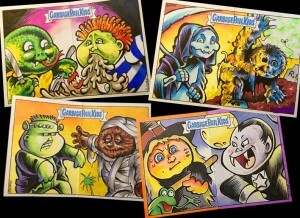 Panoramic Sketch cards, which in the previous release were in Blasters, will now be in Jumbo retail packs. 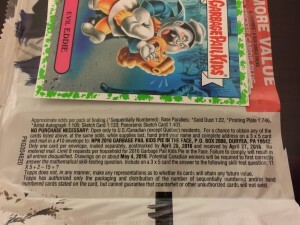 “Bonus” cards also look to be a thing of the past, as in the previous release. 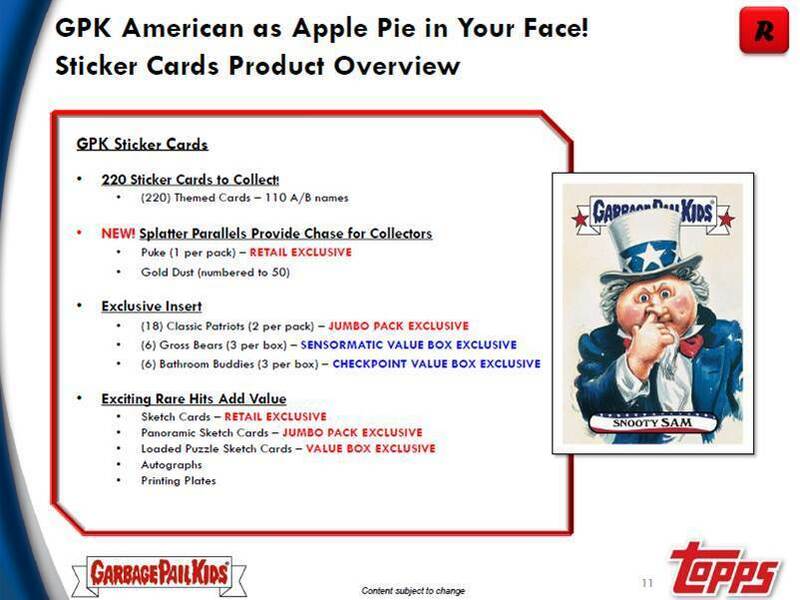 Blaster boxes will contain 3 Gross Bears stickers while Jumbo packs will contain 1 Patriotic GPK reprint per pack. 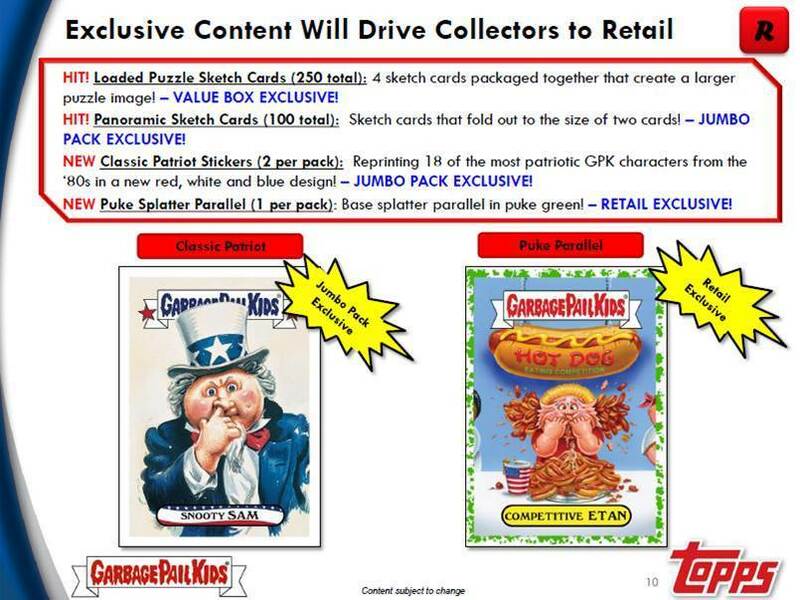 It also appears Green parallels will return to retail packs once again. 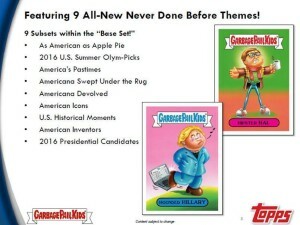 No word yet on Target or Walmart exclusive parallels. 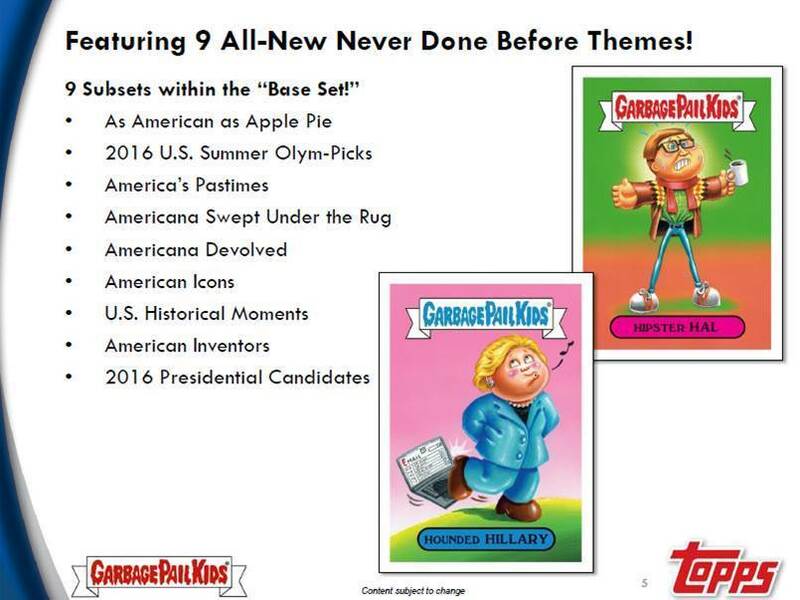 The next set is due to hit store shelves on Jan. 20th. 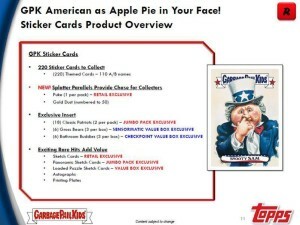 See below for more info on retail offerings. 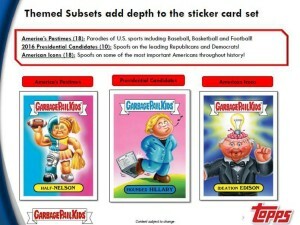 4 packs and 3 Gross Bears Stickers per box. 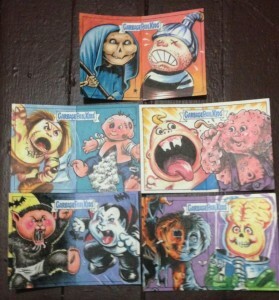 9 base cards and 1 Puke Parallel per pack. 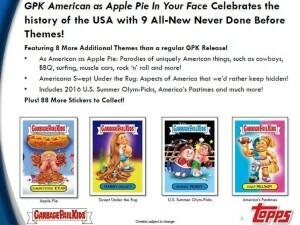 GPK American as Apple Pie In Your Face Celebrates the history of the USA with 9 All-New Never Done Before Themes! Veteran Garbage Pail Kids Artist Dustin Graham shared examples of the sketches he drew for the upcoming 2016 GPK American as Apple Pie In Your Face set. Dustin shared the photos via his artist Facebook page, Wacky Graham’s Garbage. 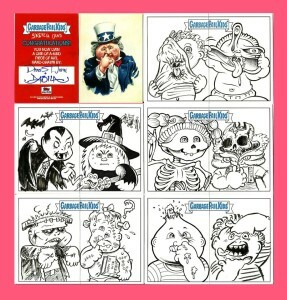 These are just some examples of the sketches you can pull in the next set due out Jan. 20th. 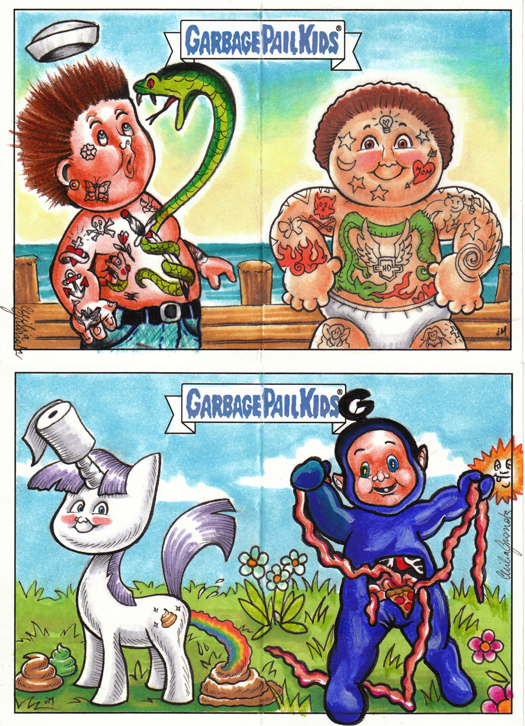 Here’s a sneak peek at some sketch cards I did for the upcoming 2016 Garbage Pail Kids set, in stores soon!